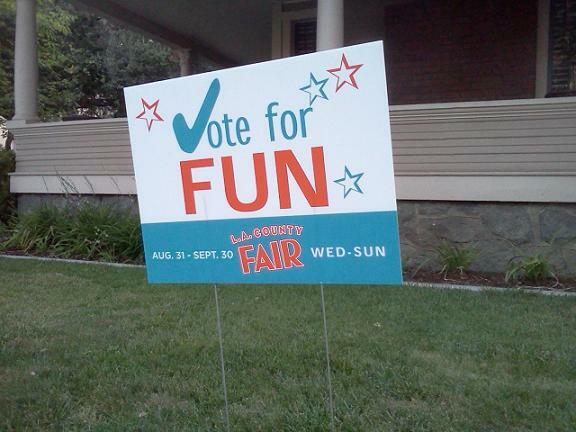 …if only because the signs promote the L.A. County Fair. Seen in Claremont. Question: What is “Jeopardy”? Wednesday’s column (read it here) recounts a local connection on the show. I also have a report from a La Verne council meeting, a report from a Dodger game and a few news and notes from around the valley. You should be able to access Donut Man’s FB page to watch the video clip. America’s next great mass transit city: LA? A piece in Slate magazine headlined “L.A.’s Transit Revolution: How a ballot initiative, a visionary mayor, and a quest for growth are turning Los Angeles into America’s next great mass-transit city” begins in, of all places, Claremont. “On a recent visit to Southern California, I began my day in Claremont, where I’d spoken the previous evening at a Pomona College event. I walked from a hotel near campus to the Claremont Metrolink station, where I grabbed a commuter rail train to Union Station in downtown Los Angeles. From there I transferred to the L.A. Metro’s Red Line and rode up to the Vermont/Santa Monica station and checked into a new hotel. I had lunch in that neighborhood, and later walked east to meet a friend for dinner and drinks in Silver Lake. 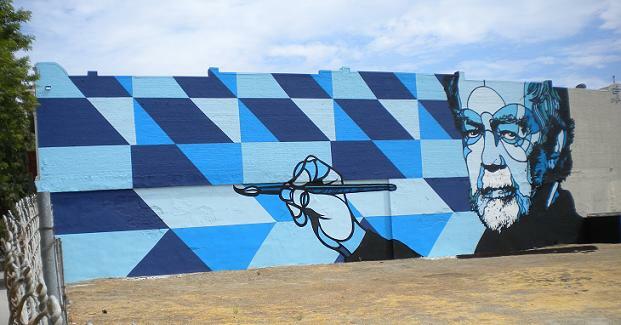 The first public mural since the adoption of Pomona’s public art ordinance, the above piece was completed in August by artist David Flores and depicts Karl Benjamin, the late Claremont painter, who died in July at age 86 and who had approved the mural. It’s on the west side of the Pomona Billiards building at 400 W. Second St., which dates to 1911. Read more about the mural, and watch a video about it, here. Sunday’s column (read it here) has an item on a pizzeria owner who delights in playing harmless pranks on customers, a clutch of vignettes and cultural items, and more. Column: Two elections in Chino Hills: How does it feel? Friday’s column (read it here) muses about 1) Bob Dylan’s new album, “Tempest,” and 2) a Chino Hills council meeting. I had meant to spend Tuesday evening listening to the new album but went to the meeting instead. Both turned out to be highly enjoyable! 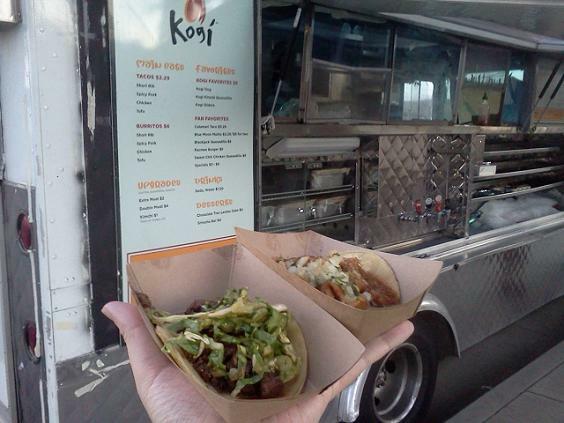 The Kogi BBQ taco truck is the most famous of L.A.’s legion of food trucks. I’ve visited it three times when it came to Cal Poly Pomona. It was only recently that I learned the truck goes there every Thursday. For all I know, it’s been doing this all along. Whether it has or not, if you’re a foodie, you should try it at least once. I went there last Thursday to meet my friends Gail and Alan, two food adventurers who recently moved to Pomona from Chicago. Maybe because the semester isn’t in swing yet, there was no line. I repeat: No line. No line? No lie. This, it must be said, compares favorably with my other visits, in which I waited for a half-hour to an hour to order. I didn’t mind — I know the New Diner blogger disagrees — but for me, waiting with friends, or even alone, as part of a special occasion isn’t a big deal. 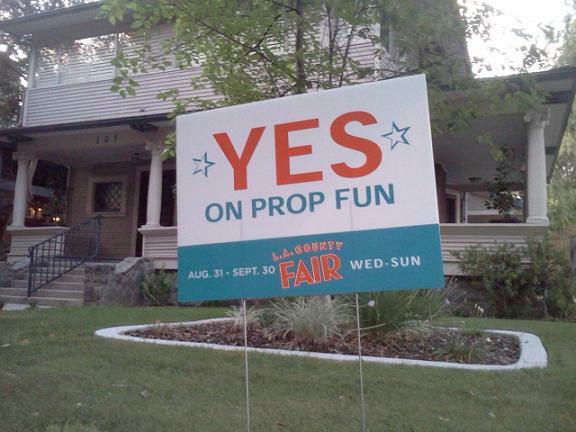 The novelty factor still applied. Much better, though, not to have to wait at all. 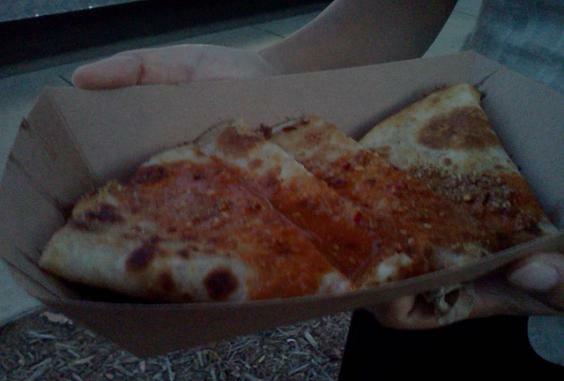 The truck parks at Valley and Temple boulevards from 6 to 8:30 p.m., then goes to the City of Industry. The schedule is here. The wait might still be short for now. Above are two tacos, the signature short rib, left, and calamari; below is a kimchi quesadilla. The latter and the short rib taco, burrito and sliders are recommended. The calamari taco was okay; the tofu taco is better. Other menu items are as yet unexplored. It was on Sept. 12, 2007 that this blog debuted: five years ago today. Ah, time flies when you’re having fun. As of Tuesday, I’d written 1,751 published posts and this blog had received 7,594 reader comments. I’m still enjoying this extra venue and hope you are too. Thanks for reading and for doing your part to make this blog work. Wednesday’s column (read it here) is about Monday’s Upland City Council meeting. It was a good one! That would be the Curbed LA blog and Millard Sheets, respectively. The blog is posting all week about the Pomona-born artist who had such an impact on Southern California art and architecture. Click on this link for what’s been posted to date, and keep checking back for more if so inclined. So far there’s a photo tour of the former Sheets art studio in Claremont (now an optometrist’s office), photos and text about Sheets’ bank commissions and an image of his painting “Tenement Flats,” one of my favorites. Thanks to Bob House for the link.